Note: This is a corrected version of an earlier version of this story, which incorrectly identified the large brush fire as another fire that occurred on Marlin Road. This story has also been updated with information about a Fire Weather Watch that has been issued for our area for Wednesday by the National Weather Service. 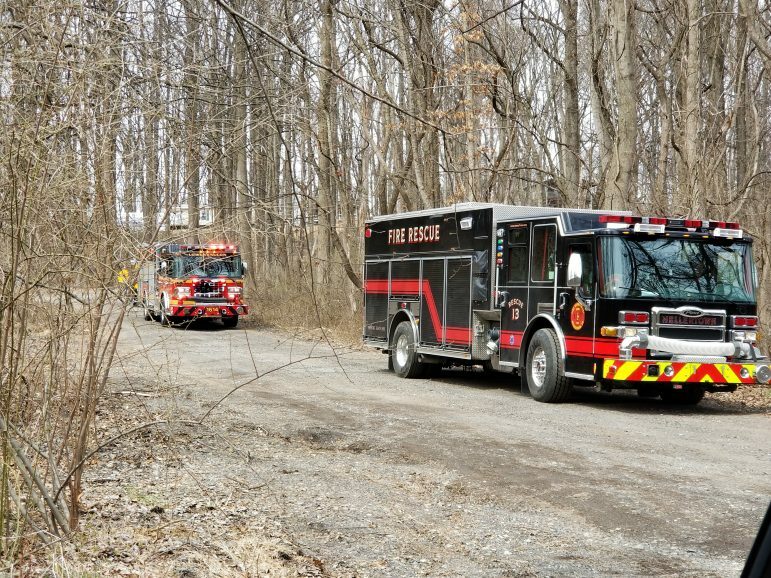 As of early Tuesday afternoon local volunteer fire companies were fighting what was described as a “very large brush fire” in the Wassergass section of Lower Saucon Township. Dewey Fire Chief Mike Maguire said the fire is in the 2300 block of Wassergass Road, between Petran Lane and Squire Lane. As of 2:30 p.m. fire and ambulance crews remained on scene there. Fire and emergency vehicles are massed in the 2300 block of Wassergass Road, where a large brush fire broke out Tuesday afternoon. The fire was not visible from the road. 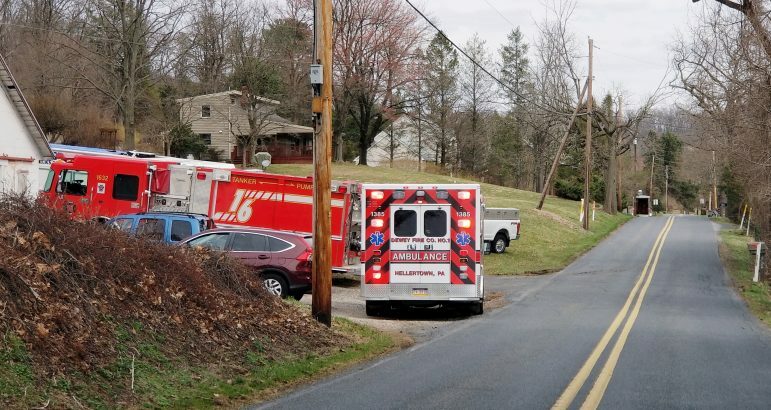 The Northampton County Emergency Alerts Facebook page reported that crews were also at a fire scene in the area of the 2200 block of Marlin Road, which is off Apple Street between Alpine Drive and Lower Saucon Road in Lower Saucon Township. Maguire said that was actually a smaller fire caused by a downed power line and that it was under control as of 2:30 p.m.
Lower Saucon Fire Rescue vehicles in the 2200 block of Marlin Road, Lower Saucon Township, where a smaller fire caused by a downed power line was brought under control Tuesday afternoon. Dewey Fire Company, Lower Saucon Fire Rescue and other departments from throughout the area responded to extinguish the blazes. Favorable weather conditions for brush fires are expected to persist through mid-week. The National Weather Service has issued a Fire Weather Watch for Northampton and Lehigh counties as well as much of southeastern Pennsylvania and most of New Jersey from 10 a.m. through 9 p.m. Wednesday. On Wednesday, high temperatures in the 60s are expected, along with winds gusting at speeds of up to 35 mph and low relative humidity. “Gusty winds and very dry air will create conditions that may promote the rapid spread of wildfires,” the weather statement indicated. Please note that this is a developing story. Additional information will be added if necessary, when it becomes available. 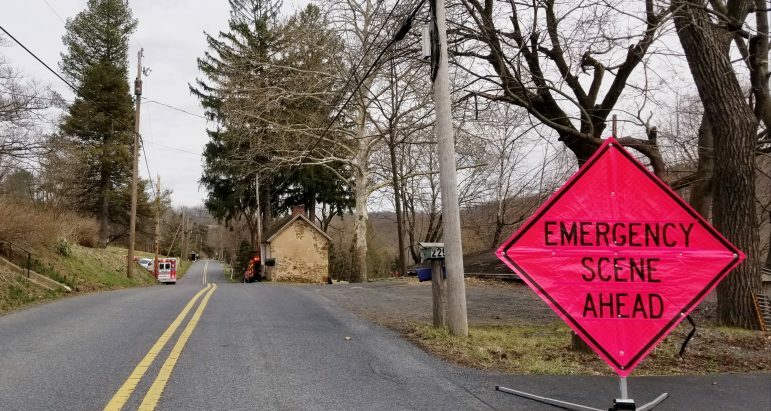 A road flag alerts motorists to the presence of fire vehicles in the 2300 block of Wassergass Road, Lower Saucon Township. The staging area is to fight a large brush fire that broke out Tuesday afternoon. Which 2 Hellertown Streets Will Be Repaved This Summer? Which Restaurants are Part of Southern Lehigh Restaurant Week?